It is essential to be able to manage the countries and regions your users can choose from when registering or making an invoice. Jomres comes with Jomres with a pre-defined base of countries and regions but the extension also gives you the ability to add custom ones. 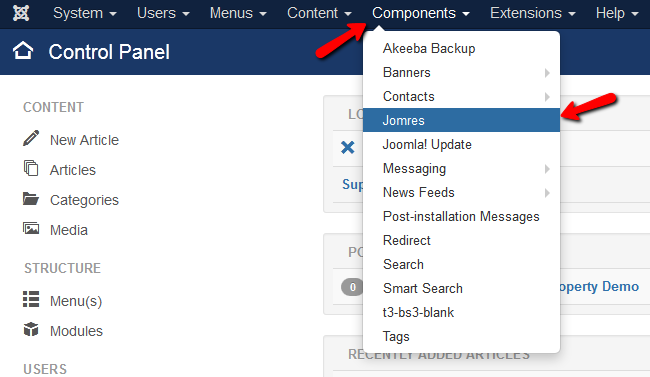 To add a new country you will first have to login to your Joomla admin dashboard and navigate to Components>Jomres to open the Jomres back-end. Now you will need to access the Site Structure>List countries section from the main panel. Hit the +New button at the top left corner of the page. Here you can fill out the Country code and Country name for the country you wish to add. Click the Save button to create the country. We will now edit the country we have just created. In order to do that we will need to find the country and click on the Edit button corresponding to it. Here you can edit the Country code and name. Click on the Save button to apply the changes. You can also hit the Delete button if you want to remove the country from the country list. Note that this will immediately remove the country without any prompt messages for you to confirm the deletion. In this step we will add a new region to our newly created FireCountry. Navigate to Site Structure>List regions section of the main panel. Here you can see all of the regions and to what country they belong to. Click on the +New button at the top left corner of the page to create a new region. From the Country name drop-down menu you will choose the Country for which you want to add the region, in our case FireCountry. In the Region name field we will write the name of the region and click the Save button. The region has been successfully added and can be seen in the Region list. We recommend you use the search function when looking for a region as some countries have a lot of regions and manually trying to find the one you need might become a tedious task. To edit a region you will need to find the region you want to change on the Region list and click the Edit button for that region. When you have finished editing the region, click on the Save button to save the changes. If you click on the Delete button you will remove that region instantly. Congratulations! You now know how to fully configure the Country/State/Region options of your Jomres based website.